Good trip back in time there. 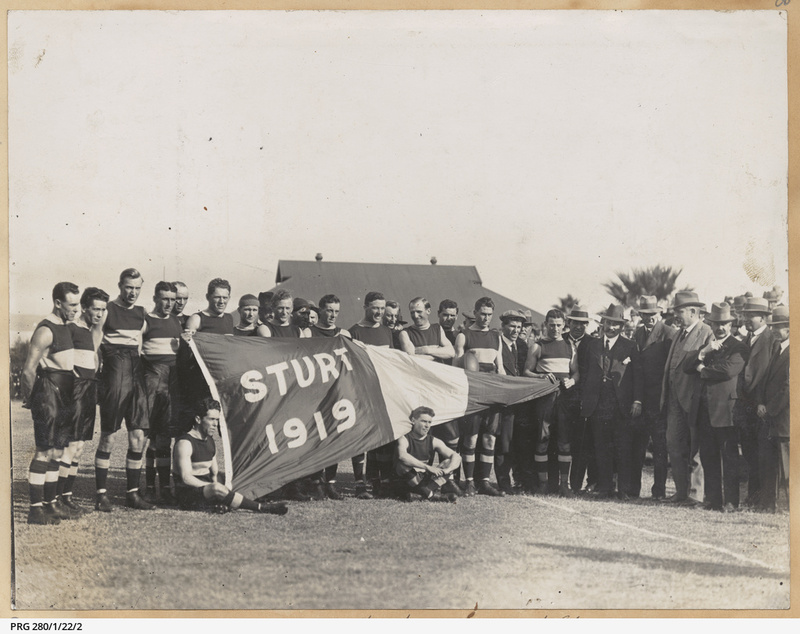 Suppose this was THE Flag of 1919, strange it has "Sturt" on it, perhaps two Flags were made for the Grand Finalists, one awarded to winner, the other one binned?? 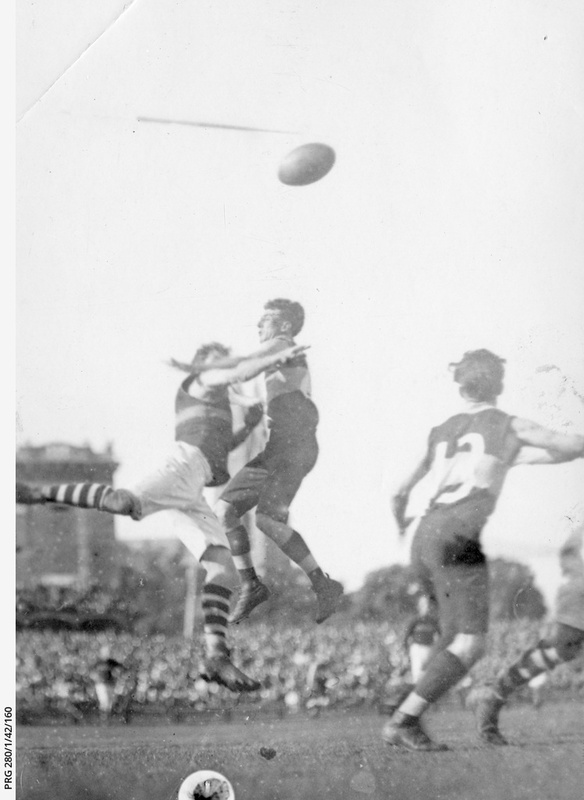 Players from North Adelaide and Sturt Football Clubs jumping for the ball during a football match at Adelaide Oval 1922. 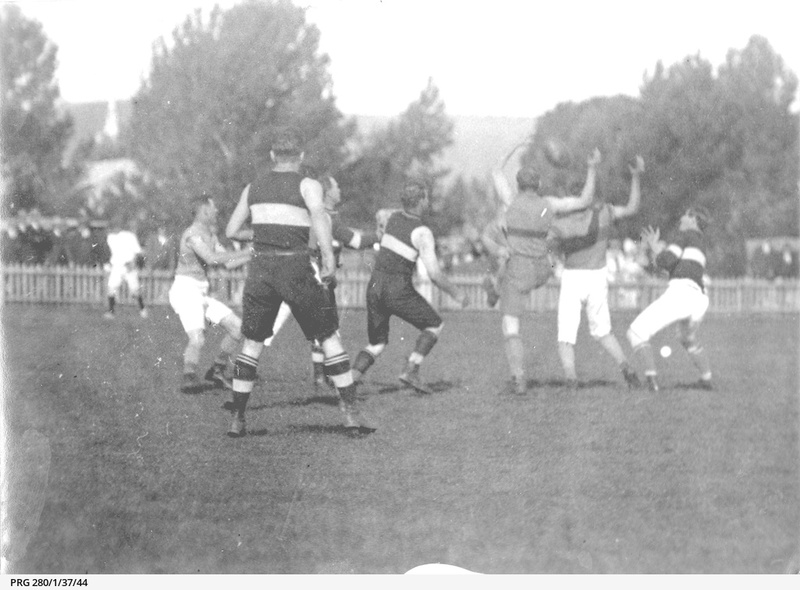 An action shot of football players in action during a match held between Sturt and North Adelaide, August 30 1919. 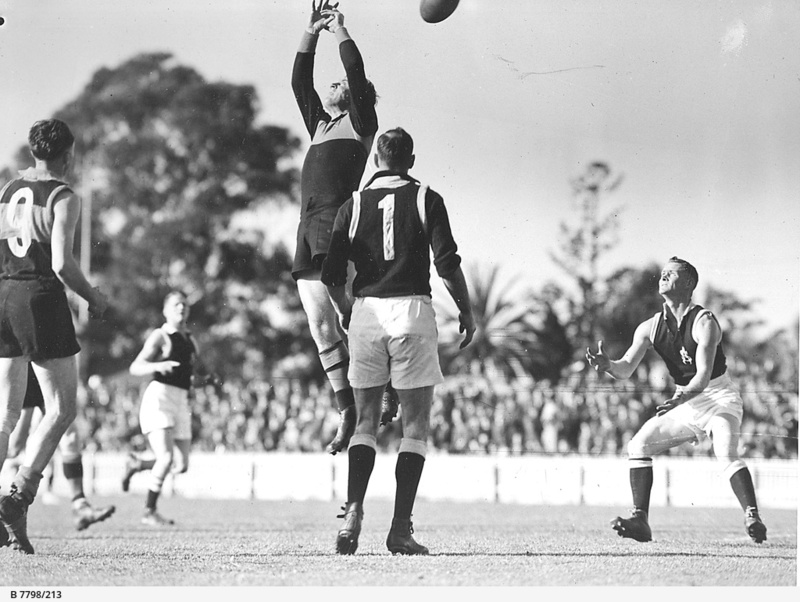 Close view of four Australian Rules Football players from Norwood and Sturt clubs during a game in Adelaide. 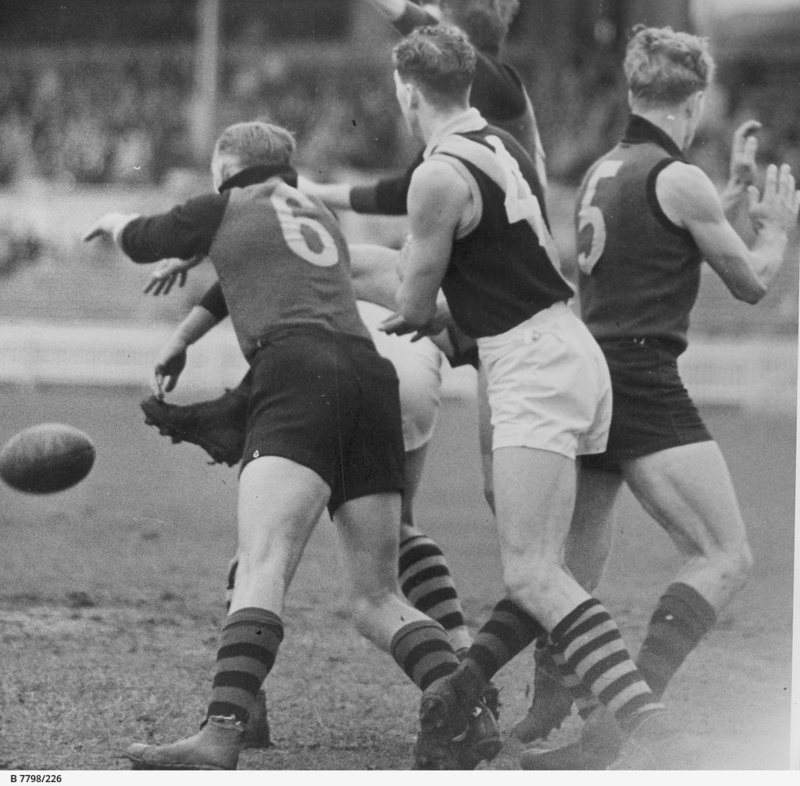 Sturt and West Torrens Football players reaching for the ball. 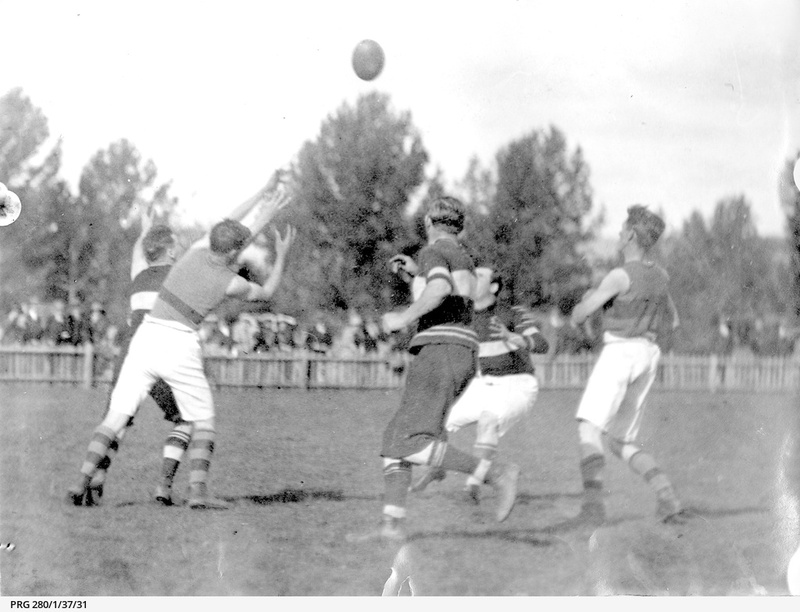 Five football players from the Sturt and West Torrens Football Clubs reaching for the ball during a football match. 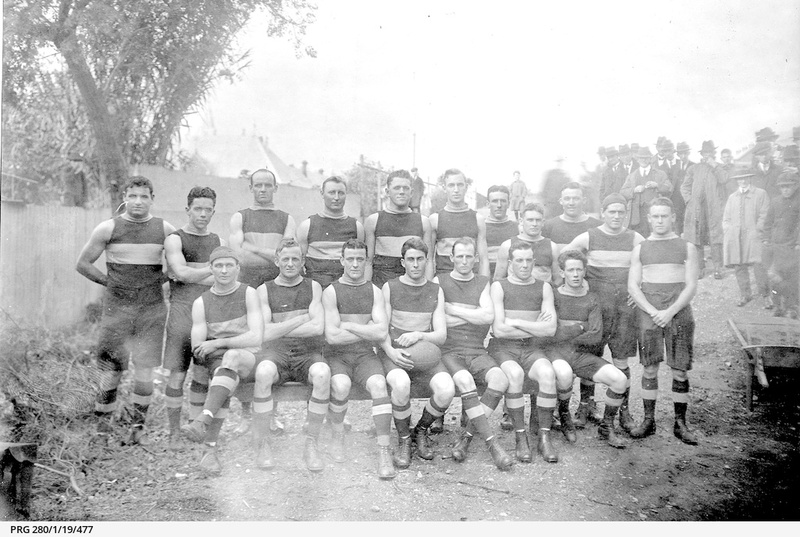 Sturt and West Torrens Football players during a game in Adelaide. 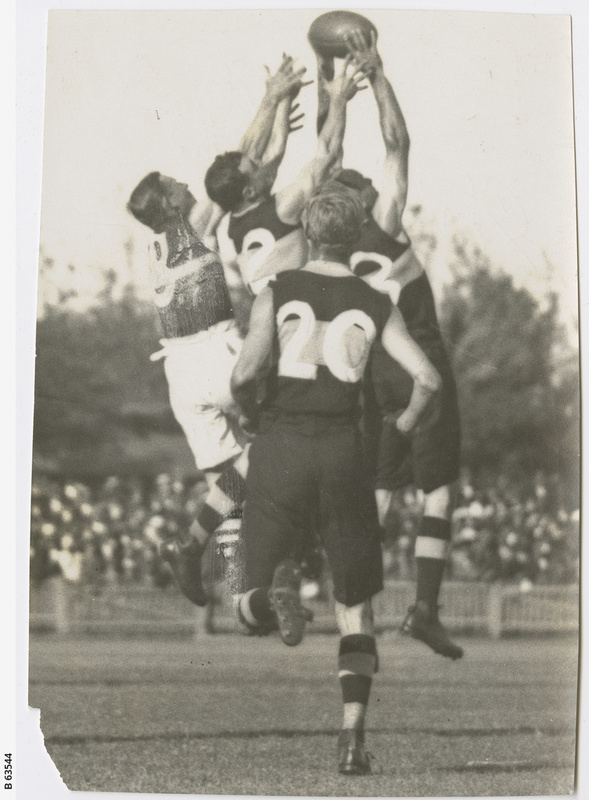 Football players from Sturt and West Torrens Football Clubs jumping after the ball during a game in Adelaide. 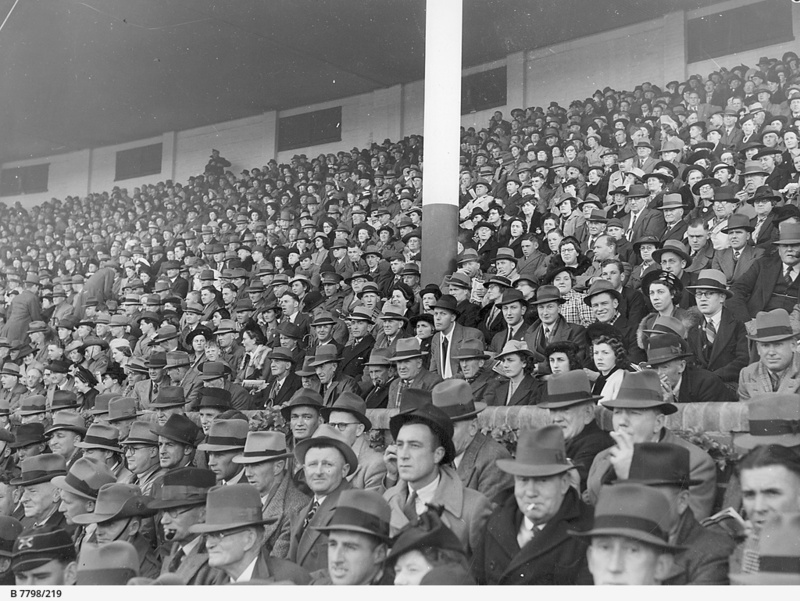 Part of the crowd at Adelaide Oval for the premiership football match (S.A. League) between Sturt and South Adelaide. 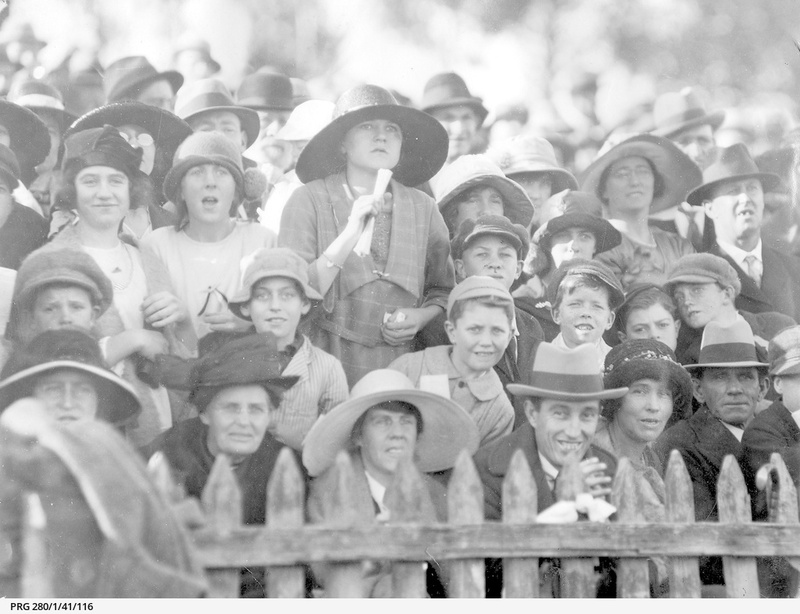 Close view of spectators enjoying a football match between Port Adelaide and Sturt; children, women, and men are all smiling as if a goal has just been scored. Great pics. Not many in the last 2 photos without hats! Interesting as late as 1940 there were no scarves etc with team colours, I wonder which era these came to vogue, 1950's as a guess?? 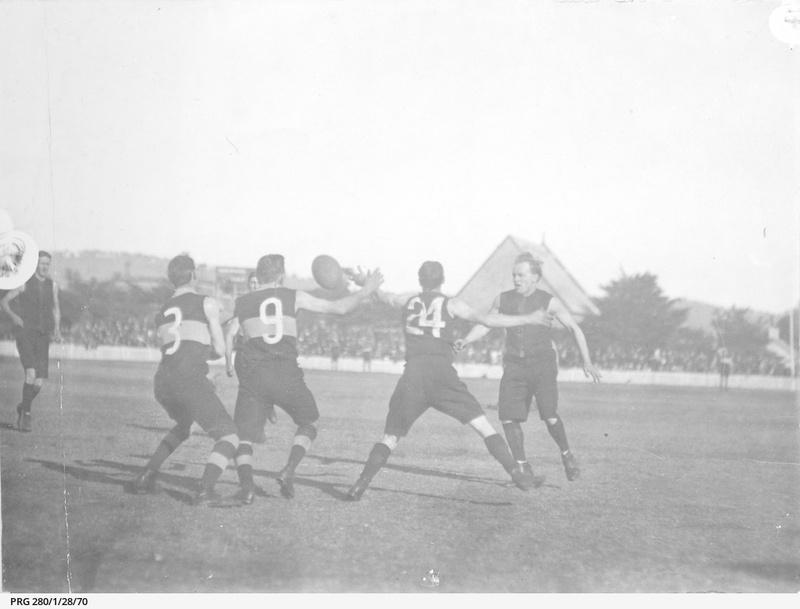 Football players during a match between Sturt and Glenelg Football Clubs. Simply Magnificent photos Smithy - Thanks very much. Yes thanks Smithy, great memorabilia. I notice in that last photo they're wearing (black?) arm bands. It would be fascinating to know who that was for. 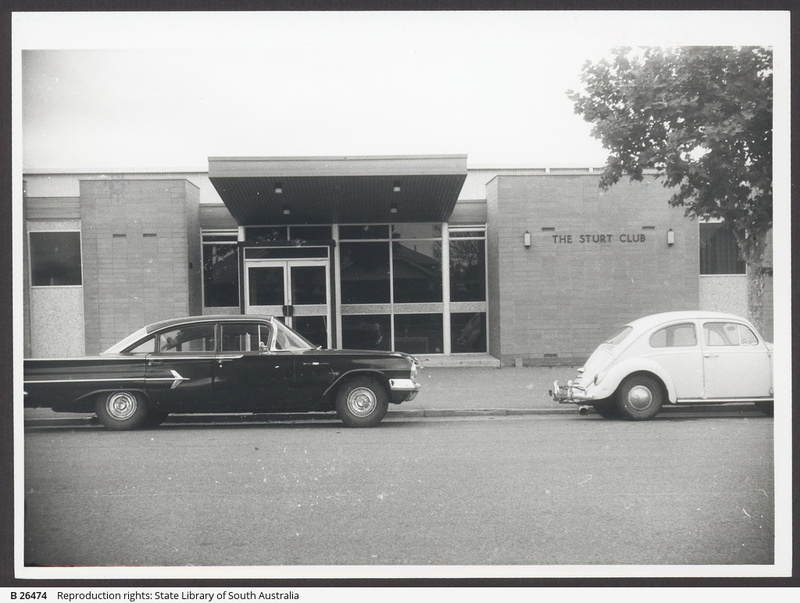 A postcard sent to Miss Ethel Lucy of Modbury from her Uncle Len that shows his support of the Sturt Football Club. Dated September 2nd 1906. 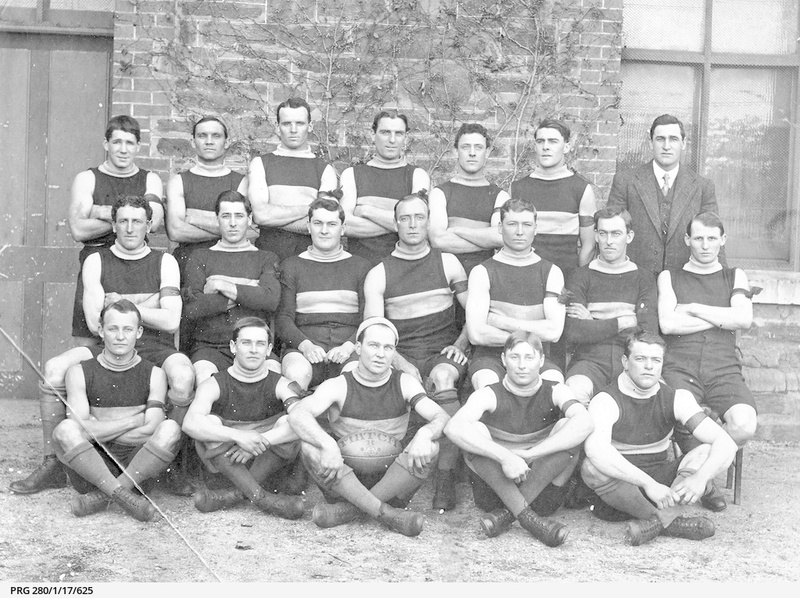 1906 was the year that Sturt first made the South Australian Football Association (forerunner to the South Australian National Football League) finals but they were not to win their first premiership until 1915. 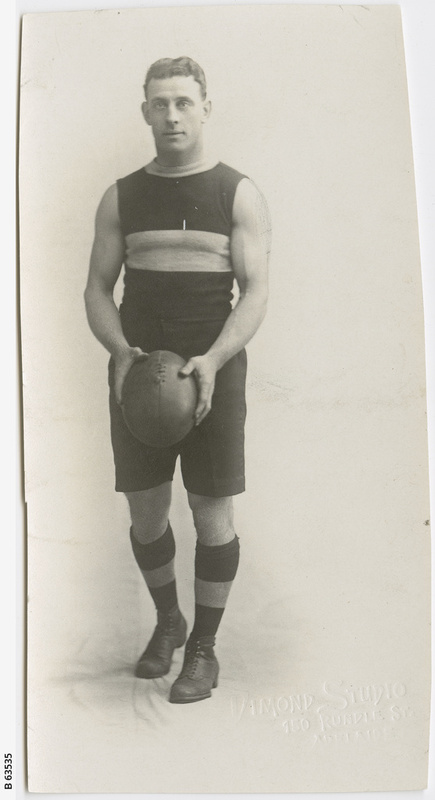 During the 1906 season Sturt included the 1903 Magarey Medallist HS 'Taffy' Waye who would drive a horse and buggy from Willunga to ovals all over Adelaide every Saturday to pull on the double-blue. 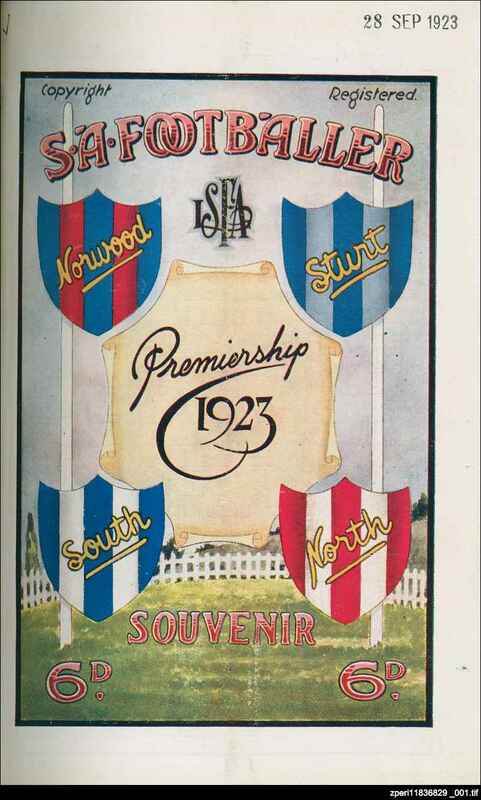 The SA Footballer was first published in the 1919 season and continued until the end of the 1926 season. 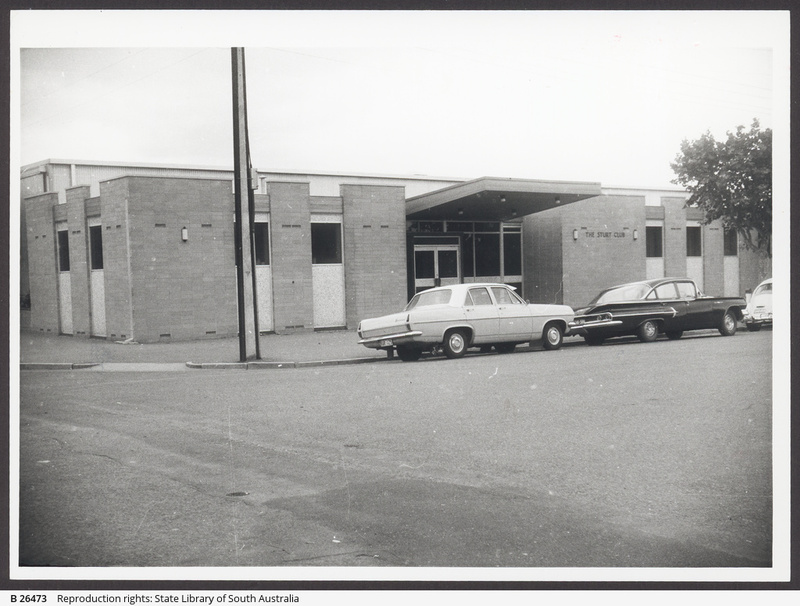 From 1927, the year the South Australian Football League (SAFL), changed its name to the South Australian National Football League (SANFL), it has been known as the South Australian Football Budget. 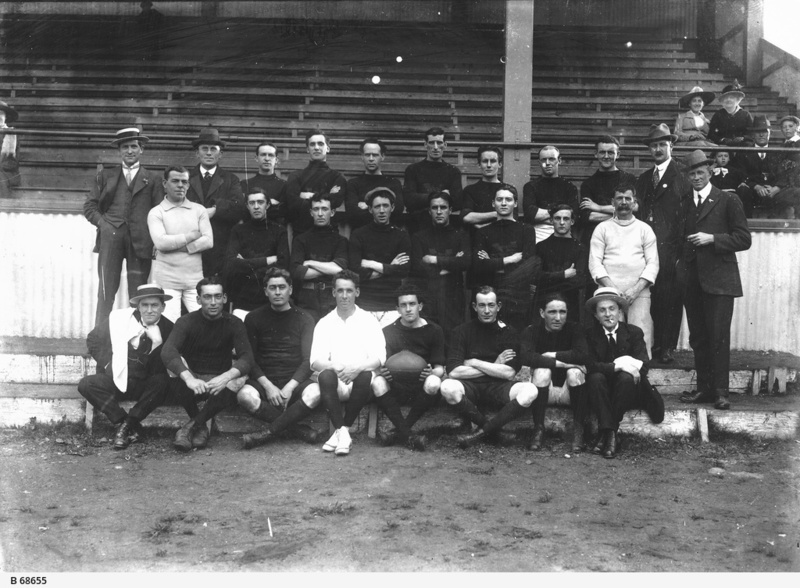 Previously an SA Football Budget was published for the 1914 and 1915 seasons ending when the league competition went into recess for the rest of the First World War. All of these were official publications of the League. 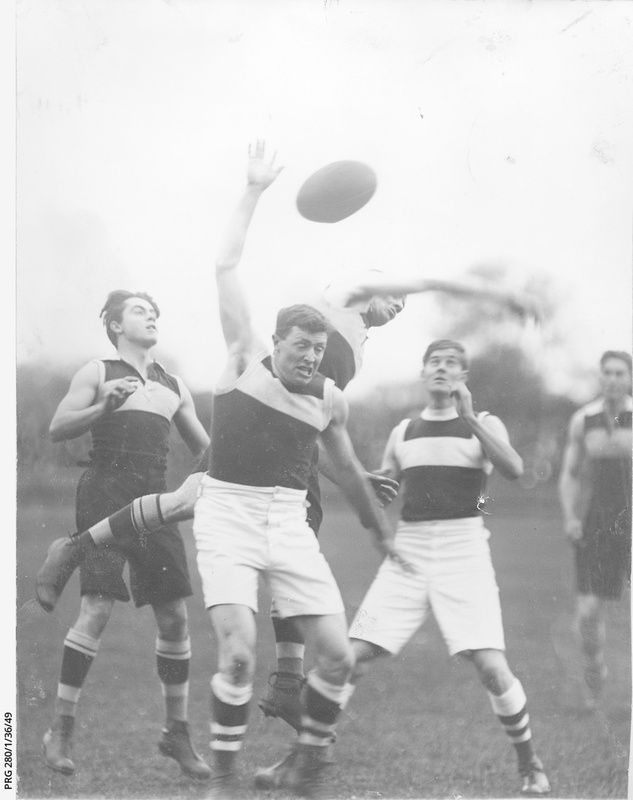 This example of the SA Footballer is from the 1923 finals series. 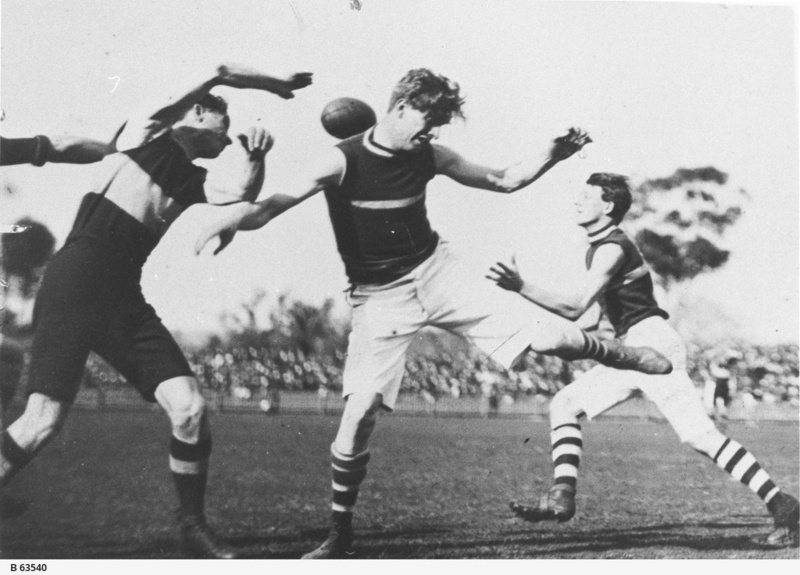 The 1923 premiership was won by Norwood led by their captain Sid White and three time winner of the Magarey Medal, Walter 'Wacka' Scott. 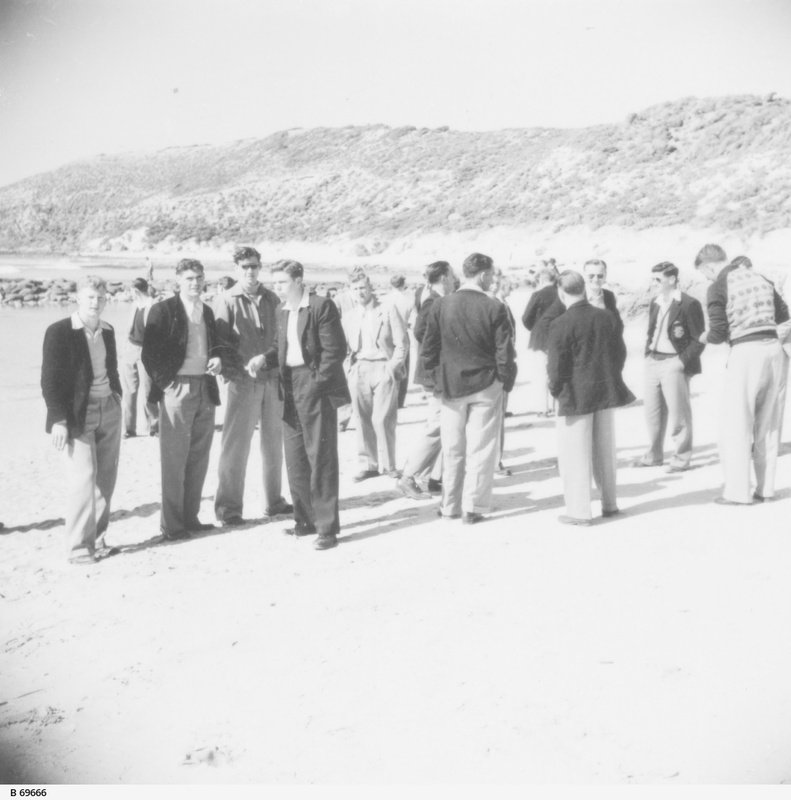 They defeated North Adelaide, captained by Percy Lewis, in the Grand Final. 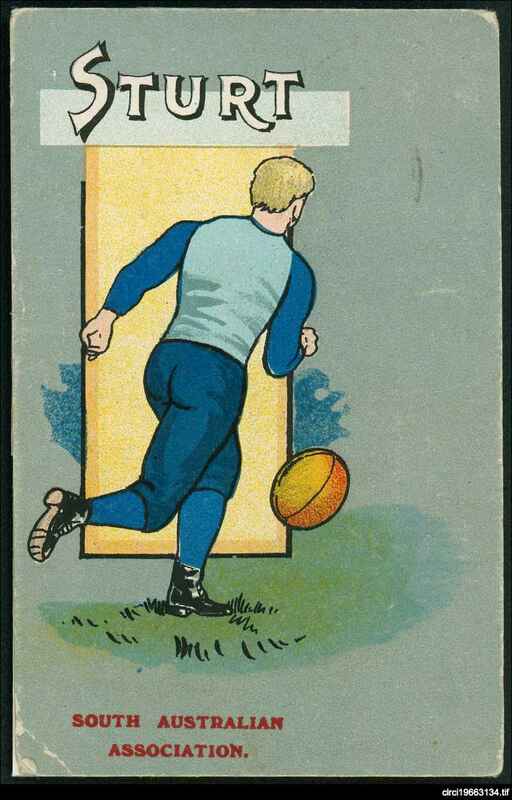 The first magazine dedicated to football was The Footballer which was published during the 1888 season. A later periodical, also called The Footballer and published by different publishers, was available during the 1907 and 1908 seasons. 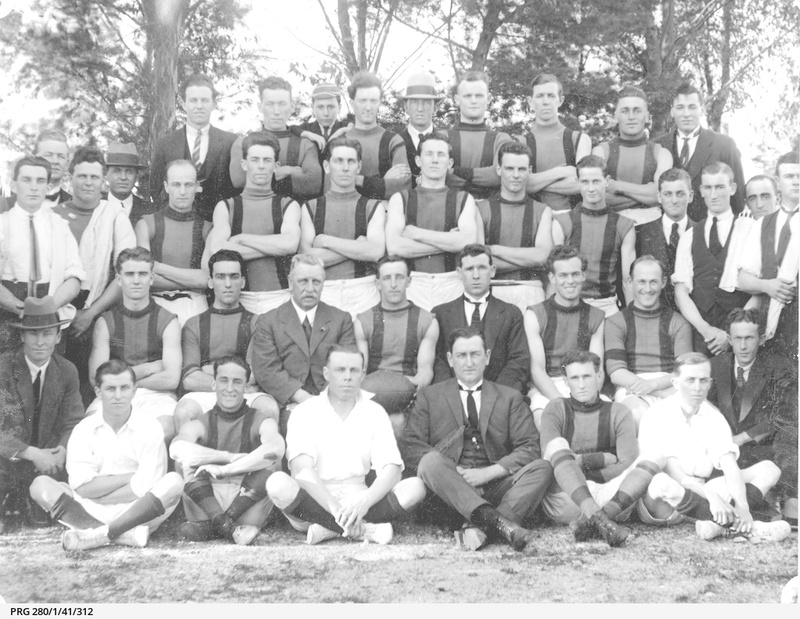 The team photo of 1934 is a brilliant snap. 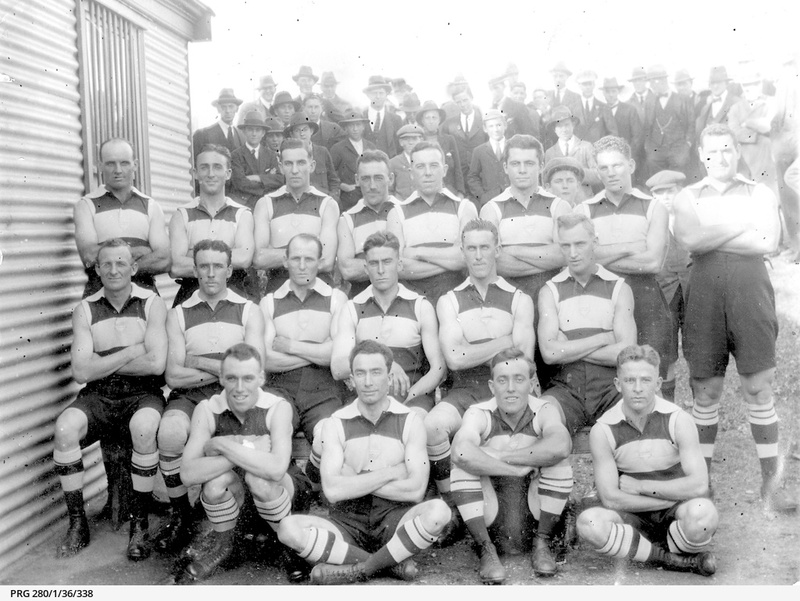 The colours and guernseys look great, as do the socks! Would make a great "alternative" guernsey if ever the club feel the need for one. 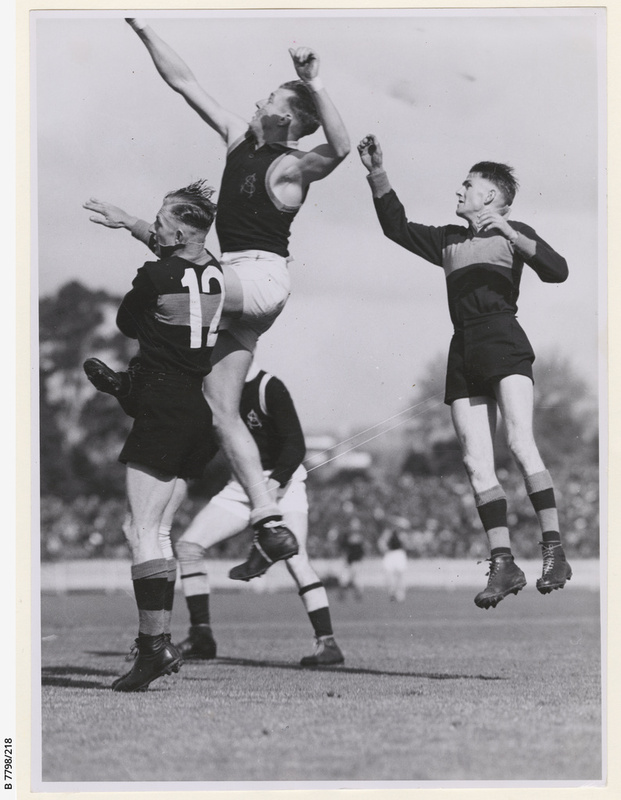 Len Fitzgerald looks a supreme athlete back then.